SAN FRANCISCO – Coming off another eye-popping weekend, Cal senior Kristine Anigwe has been named the Pac-12 Player of the Week for the fourth time this season, the conference office announced on Monday. 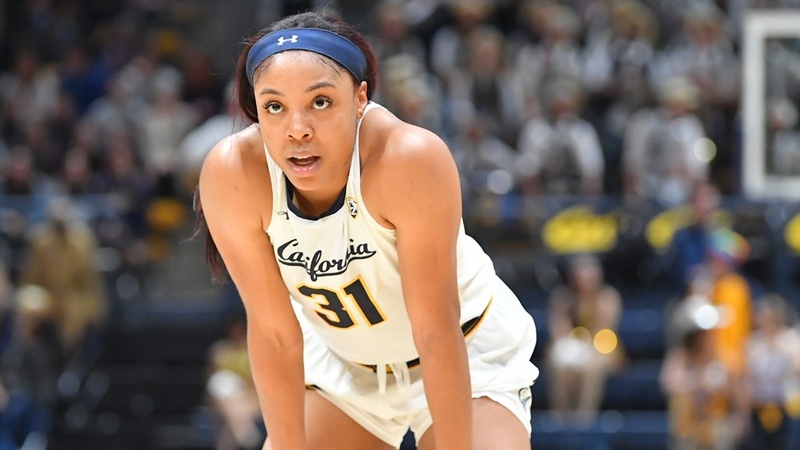 Anigwe posted back-to-back games with 20 points and 20 rebounds as the Golden Bears secured the series split against the eighth-ranked Stanford Cardinal. Anigwe also moved into a tie Cal's all-time scoring record with 2,320 career points. USC freshman Shalexxus Aaron was voted the conference freshman of the week. Anigwe began the weekend with a 25-point, 24-rebound performance on Thursday night as Cal upset No. 8 Stanford, 81-80, in the opening leg of the Battle of the Bay. Anigwe's 24 rebounds were new season-best and the most by any Pac-12 player in the last two seasons. The 6'4" Anigweleads the nation in rebounding with 15.6 rebounds per game, nearly two full rebounds ahead of any other player in Division I basketball this season, male or female. Anigwe scored 15 of her game-high 25 points in the second half as Cal picked up its first Top-25 win of the season and its first home victory over at Top-10 team in over a decade. With her 25 points and 24 rebounds on Thursday night, Anigwe became the first player in 20 years to have a 20-point/20-rebound performance against the Cardinal. Anigwe followed up Thursday's performance with another 20/20 effort on the Farm, finishing with 20 points, 20 rebounds, and two blocked shots. The three-time All-Pac-12 selection once again led all players in scoring while becoming the first player in the nation this season to have 20 points and 20 rebounds in back-to-back games. A midseason candidate for the National Player of the Year and Naismith Defensive Player of the Year,Anigwe now has four 20-point/20-rebound games this season, three of which have come in conference play and two against Top-25 opponents. No other player in the nation has more than two 20-20 games this season. With 45 combined points this weekend, Anigwe also tied Colleen Galloway '81 for the program's all-time scoring record with 2,320 career points.Anigwe is only 21 rebounds away from breaking the Cal career rebounding record of 1,219, currently held by Gennifer Brandon, and ranks in the Top-10 in conference history in both scoring and rebounding. The nation's leader in double-doubles this season, Anigwe extended her double-double streak to 22 in a row, taking sole possession of the fifth-longest streak in Division I basketball history and the second-longest by a Pac-12 player. Anigwe and the Golden Bears will be back in action on Friday, taking on No. 3 Oregon (21-1, 10-0 Pac-12) at 8 p.m. PT at Haas Pavilion.